Is Krishna consciousness polytheistic? A discussion of panchopasana provides a clear answer that also helps us understand all religions. 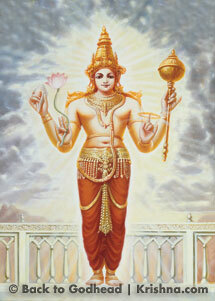 At first blush, Vaishnavism may seem polytheistic, given the various gods associated with the Vedic pantheon. But if we look slightly beneath the surface, we see there is more to this so-called polytheism than meets the eye. The concept of monotheism – that there is only one God – tends to be associated with the Abrahamic religions (Judaism, Christianity, and Islam), but it is found elsewhere as well. So the first point to be acknowledged is that monotheism is more pervasive than is commonly understood. Also, due to monotheism’s association with biblical religion, it is often seen as necessarily opposed to pantheistic and polytheistic points of view. But all is not so simple. In fact, monotheism overlaps with Indic monism – the idea that everything is, in some sense, God. And standard monotheistic religions too sometimes include a plurality of “gods.” For example, certain Christian groups see God as the Trinity, or three eternal persons – the Father, the Son, and the Holy Spirit. In this way both pantheism and polytheism sometimes interpenetrate monotheism, and vice versa. This verse, found in one of the world's oldest religious scriptures, hints at the mystery and diversity of Krishna consciousness. Since its focus is “the one and the many,” it overlaps with ideas of monotheism and polytheism, and it should be explored in terms of our present discussion. Just prior to this verse, one may note, the Rig Veda praises an exotic pantheon of gods, and only then are we told that God, or Truth, is ultimately one, though known variously. What does this mean? It points to a monotheistic idea of Deity, surely, but to what else? And how does it relate to the Vaishnava tradition, with its many gods and goddesses? People know that adherents of Indian religions believe in many divinities – Brahma, Vishnu, Shiva, the Goddess, and so on – and because of this the overall tradition is commonly understood to be polytheistic. Yet it simultaneously acknowledges the existence of one supreme God, known as Bhagavan (All-Opulent One), Paramatma (Supreme Self), Parameshvara (Supreme Controller), and so on. The philosophy of Krishna consciousness agrees that God is one, but adds that He is many as well. God reveals Himself in innumerable forms and shapes and further expands into lesser divinities, and even into the entire perceivable world. This hierarchical series of divine manifestations, of spiritual separateness as opposed to oneness, is often neglected in Western scholarship (and even within modern-day Hinduism), where it is generally taught that these manifestations are all the same and somehow coalesce in a higher reality. When people born in the West are confronted with Krishna consciousness, or even Hinduism in general with its many “gods,” their minds generally resort to preconceived notions of polytheism in non-Abrahamic cultures worldwide. The idea of one Supreme Godhead appears very far away, and reconciliation seems impossible. What most people don’t know is that the various religious traditions of the world can be categorized within the divisions of panchopasana, or the worship of five types of gods: Durga, Surya, Ganesha, Shiva, and Vishnu. These five represent all the rest, and there are millions. It is this hierarchical categorization that we will explore in the remainder of this essay. The five primary gods of panchopasana and their numerous variations may be seen in three ways. First, they are alternate faces of one absolute reality who assist in the administration of the universe. Second, in this service they are separate beings performing cosmic functions. Third, they also represent categories of religious practice that indicate specific levels of spiritual understanding, as mentioned above. This third, lesser-known perspective was the insight of Srila Bhaktivinoda Thakura (1838–1914),1 the great nineteenth-century Vaishnava reformer. His view of Indic polytheism and how it interrelates with the standard monotheistic traditions with which we are more familiar is enlightening. According to Srila Bhaktivinoda, the initial quest for spirit, or Brahman, is a form of shakta-dharma (worship of shakti, or energy), for it recognizes nature as divine. For the shakta, “There is more to what we see than meets the eye.” Mother Nature is alive and fundamentally spiritual. 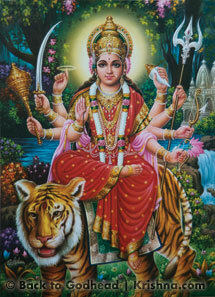 In its most basic form, shakta-dharma consists of worshiping prakriti, or material nature, but it can develop to the more sophisticated forms of Durga worship existing in India from time immemorial. Nonetheless, it is still a rudimentary form of spiritual awareness, with practitioners often still given to meat-eating and other low-grade materialistic activities. It is a beginning, a dawning of spiritual awareness. After this one realizes that even this magnificent energy, great though it may be, is still just a mundane force, generated from and subsisting in the material world. Bhaktivinoda Thakura calls this higher realization ganapatya-dharma, wherein one realizes that living beings hold the secret to higher spiritual reality. At this stage, an awareness evolves that animated living entities are more important than energetic abstractions, and gods such as Ganesha and other creatures of nature rise to prominence as the object of one’s worship. Such realization often manifests itself as the first seeds of humanism. But this evolves further, and one realizes that all creatures reach their pinnacle in man. As Srila Bhaktivinoda writes, “The fourth stage is the worship of purely human consciousness in the form of Shiva – shaiva-dharma.” Here one looks for an empowered personality, a more humanlike divinity with whom one can identify. The idea of becoming one with this divine embodiment becomes desirable, and spirituality here consists of “unitary recognition” – seeing one’s identity with all that is and with the Supreme. In this way shaiva-dharma puts forward a nontheistic spirituality, often focusing on monism, or even enhanced humanism, if with definite spiritual underpinnings. 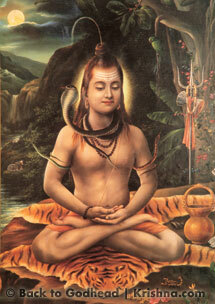 Thus the shaiva-dharma level of spirituality affords one a glimpse into the actual nature of the divine. He further informs us that all of the world’s major religions fall into one of these five categories, and that this is what panchopasana, or the worship of various “Hindu gods," is really all about. Pantheism, Shamanism, Neopaganism, Gaianism, Shintoism, Goddess worship, Earth religion, and most folk religions are in the category of shakta-dharma, as such traditions essentially recognize the divine in nature. Solar religion, or various manifestations of shaura-dharma, was popular in many ancient cultures, from India to Egypt, and still is. The earliest deities associated with the sun are Surya, Wadjet, Sekhmet, Hathor, Bast, Bat, and Menhit. The Aztecs of Mexico, as well as certain tribes of Africa, made sun worship famous. 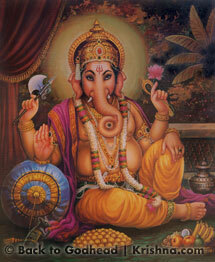 Ganesha worship is an in-between stage, not as basic as shakta-dharma and shaura-dharma, but not yet theism proper. This level of realization can be found throughout the world as well, often in the form of humanism, wherein a spark of divinity is detected in one’s fellow man. It is the seed of divine awareness and reaches its most mature form, Bhaktivinoda Thakura writes, in religions like Buddhism and Jainism, for they are akin to shaiva-dharma, with a greater emphasis on psychological empowerment and fully awakened humanism, along with a type of philosophical monism. Judaism, Christianity, and Islam, he further explains, are similar to Vaishnavism, since worship of the Supreme Godhead is the focus of these traditions. Yet Srila Bhaktivinoda is quick to point out that there is a “mundane” Vaishnavism and a “spiritual” Vaishnavism as well. The first is called bharavahi (“those who carry the burden of external rituals”), and the second is called saragrahi (“those who drink the essence”). It is this latter form of Vaishnavism, naturally, that is lauded as the culmination of the religious quest. The former is merely a variety of Hinduism, on a par with other sectarian religions. Saragrahi Vaishnavism is the eternal function of the soul and the science of spirituality, and it is this that the great spiritual masters throughout history have encouraged devotees to embrace. Therefore, those who are simply astonished by the powers of anything in the creation of the Lord, without any factual information of the Lord Himself, are known as shaktas, or worshipers of the great powers. The modern scientist is also captivated by the wonderful actions and reactions of natural phenomena and therefore is also a type of shakta. These lower-grade persons gradually rise to become shauriyas (worshipers of the sun-god) or ganapatyas (worshipers of the mass of people as janata janardana or daridra-narayana and so on, in the form of Ganapati) and then rise to the platform of worshiping Lord Shiva in search of the ever-existing soul and its identity with the Lord. After this one may graduate to the stage of worshiping Lord Vishnu, the Supersoul, whose highest form is that of Lord Krishna. The many gods associated with Krishna consciousness are individual living beings in their own right. They are cosmic administrators, and they have an accessible, down-to-earth function as representatives of universal religious categories. Through Bhaktivinoda Thakura’s lens, they offer a hierarchical understanding of how one gradually evolves in consciousness from the dawn of spiritual awakening to the perfection of spiritual life. 1. All quotations from Srila Bhaktivinoda Thakura in this article are from the essay "Sri Bhagavata Dharma Vichar." 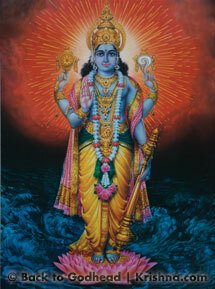 The ideas first appeared in his book Sri Krishna-samhita (Calcutta: Isvarchandra Basu, 1879), pp. 7–8. 2. Srila Bhaktisiddhanta Sarasvati here quotes his own commentary on the Brahma-samhita while replying to questions by Pandit Shyamasundar Chakravarty, a leader in India's independence movement. The exchange was published in The Harmonist. Satyaraja Dasa (Steven Rosen) is an initiated disciple of His Divine Grace A. C. Bhaktivedanta Swami Prabhupada. He is also founding editor of the Journal of Vaishnava Studies and associate editor of Back to Godhead magazine.